Vision Care Service West (VCS West) holds non-profit eye camp in Central America twice or three times a year. VCS has been providing free ophthalmology service in LA area, due to the medical care cost in the United States is high and many undocumented immigrants, especially those of Korean, cannot get proper treatment due to lack of government's medical support. 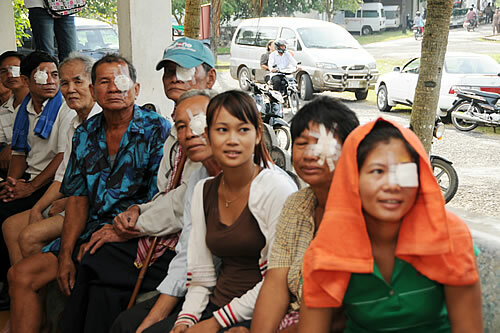 Normally, a single eye camp can provide eye checkup to about 100 people free of charge, and we provide free surgery service to around 10 cataract patients. Because we hold eye check-ups and surgeries annually free of charge, we are receiving a lot of complimentary responses for bringing light of hope to the visually impaired patients. We provide information related to the eye camp 1 to 2 weeks prior to the event through our website and other major media. For those who inquired us through phone for an appointment, we provide an event guidance call. The eye check-up is on first come first serve basis. For those who are diagnosed of cataract, we ask for a letter of self-introduction and a recommendation letter (from church, organization etc.) via mail, and then provide surgeries to those who qualify. Participant: ophthalmologist Andrew Cho, Dr. Hans Kim, Dr. Paul Lee. Dr. Edward Lee, anesthetist Dr. Young Seok Suh etc. If any questions, please call Jisun Lee (213-281-2617). - April-May, 2012: The first LA Eye Camp was held. Each patient visited designated ophthalmologist office. With the support of ophthalmologist Gun-Joon Gwak, we provided cataract surgeries to 14 patients. - June 26, 2012: Yong-Gong hosted 'The 1st eye camp', presenting a note of appreciation to 7 ophthalmologists who participated in surgeries. - 2013: From the second eye camp, we cooperated with the Hwarang Leo Club and provided service at the consulate parking lot through eye mobile cart. Thus, we could reach out to more people. - 2015: The LA Eye Camp was selected as Open Bank's Stewardship program. We held the 5th LA Eye Camp at Open Bank Olympic branch, and SoCal Nurse Association provided general health care. 2011 summer, when the article about Mexico Eye Camp fundraiser event was published, a visually impaired Korean patient sent a mail after seeing the article. In the mail, he included a proof of his had economic circumstance and the story of his agony from blindness caused by cataract infection in both eyes. We realized that there are people in need not only in far away poor country but also around us. Doctors agreed to help fellow Koreans who does not have access to medical benefits due to various reasons, thus they held LA Eye Camp and gave back light to 14 patients. Most of the applicants of free cataract surgery are illegal aliens or do not have insurance, and they could not get surgeries because they could not afford the cost that went over $5000. Some of them were waiting to meet the age requirement for the MediCare, and even with MediCare, many gave up because they could not get surgeries from the county hospitals. "I thought I would never see again but I found light again. Thank you so much"
"I am so happy to see the bright world again". The participants of 'The First LA Vision Care Camp" appreciation night, which was hosted by Vision Care Service (VCS) West at Yangon on the 26th, repeatedly thanked the doctors. The doctors and nurses who participated in the event also smiled brightly and replied "I am happy to see my patients healing". The VCS camp, sponsored by ................., provided free service to the patients over 2 month since last April at St Vincent Department of Optometry. 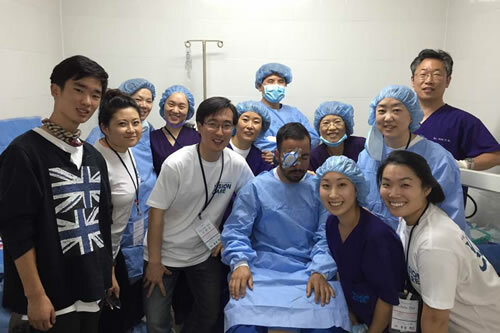 7 Korean ophthalmologist volunteers provided free medical service to the patients in need. The ophthalmologists involved were .......... Korean nurses at Saint Vincent hospital did not hesitate to join once they heard about the news. 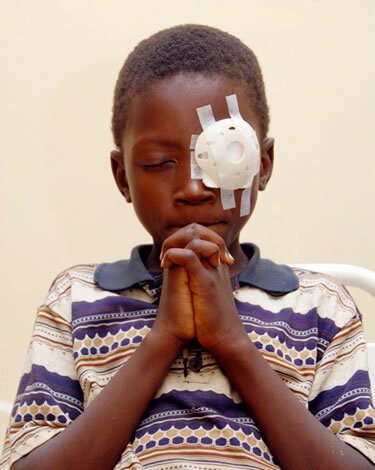 They healed 40 patients' eyes, and provided free surgeries to 14 low-income cataract patients. Dr. Andrew Cho, who provided free surgeries to 7 patients, explained: "in actuality, there are many low income Korean people living with blind eyes because they cannot afford the medical cost. I am more than happy to help them out." 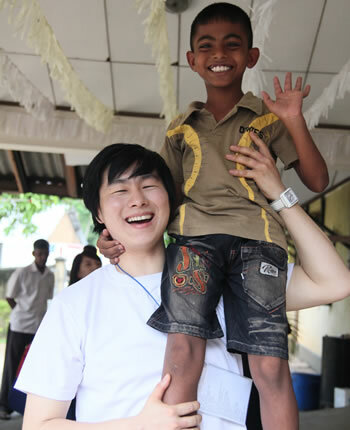 Ophthalmologist Hans Kim added "It was a meaningful volunteer experience to me. I would love to participate in Vision Care Camp again and help the low-income people in need." Ophthalmologist Dr. Kwak, who donated $10,000 to the camp, said "Like many others, I only tried to help my neighbors. I hope the recovered patients can live their meaningful lives." Sun Rae Kim (56), who recovered the eyesight of her right eye, showed her appreciation: "to a single mom raising 2 sons, I could not afford the surgery fee that cost several thousand dollars. I hope this camp can continue on to help people in need like I was." VCS West chairman Alex Zhang commented: "We could hold this event successfully only because of the supports from our sponsors and the volunteers." Furthermore, he pleads "We will persevere to continue the LA Eye Camp, and I sincerely ask our community for their prayers and supports."